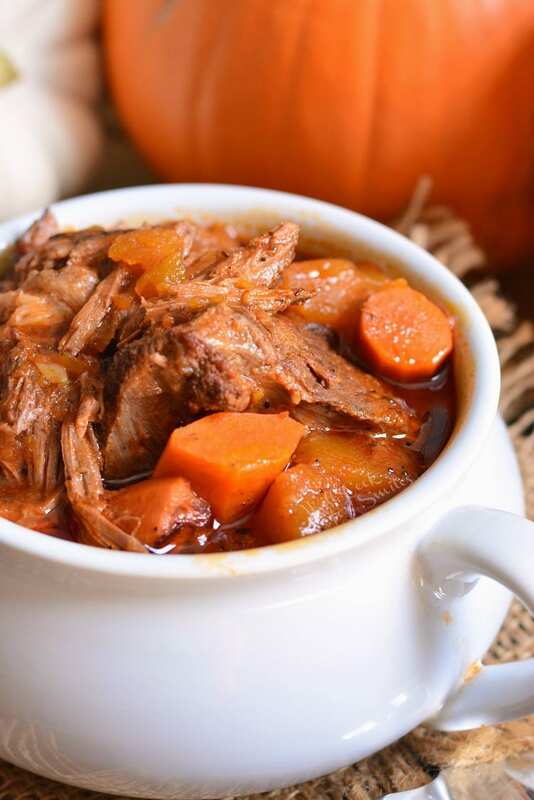 Crock Pot Roast with pumpkin is a perfect seasonal twist on on a classic comfort dinner. This Crock Pot Roast recipe will have you singing a happy tune all day. 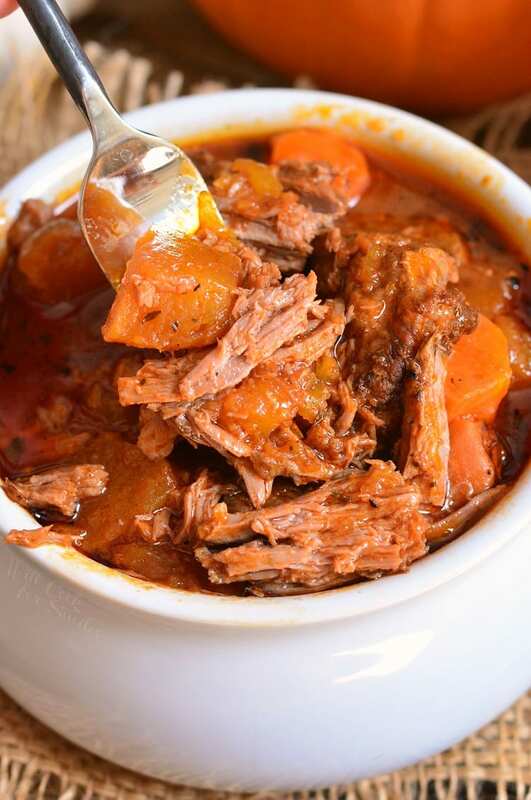 Deliciously tender roast made in a slow cooker with fresh pumpkin, carrots, onions, and flavorful tomato based gravy. The season for pot roasts and other delicious crock pot meals is finally here. I’m also happy to announce that pumpkins are finally here too! For the past month, I’ve been stalking my grocery stores to see when the pumpkins will be arriving. Finally, last week I saw the beautiful orange display in front of the store. There must have been a hundred huge carving pumpkin up front and in the inside display. After running around the produce area for 10 minutes, searching it up and down, I could not find cooking pumpkins anywhere. A brief panic came over me and I grabbed the closest employee I could find. The poor young boy didn’t know what I meant by cooking pumpkins vs carving pumpkins. Luckily, a manager was close by and he brought out a box of cutest little cooking pumpkins for me. I was really excited and was going to grab the whole box but I held myself back. There is just no way I could cook that much pumpkin at one time. We’ll take it one recipe at the time and I will be starting with Crock Pot Roast with Pumpkin. Which cut of meat to use for pot roast? 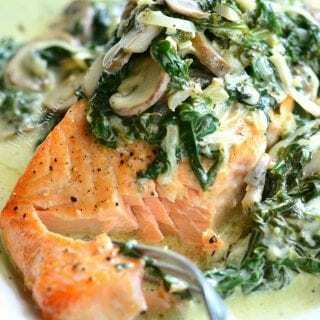 You have a few options to use for pot roast but the main three include chuck roast (shoulder), bottom round roast (rump roast), and top round roast. Personally, I exclude the brisket from the options for the pot roast because I think that cut is wasted on the pot roast but if you really want to, you can use a brisket. Chuck roast and rump roast are the more inexpensive options and they are a little tougher than then top round roast. Rump roast tends to be the cheapest option of all three. Since top round is a little leaner cut of meat (and a bit more expensive), I don’t usually use it in a pot roast cooked in a crock pot. I have a few tips for making a pot roast. Once you choose your meat cut and all ready to make your post roast, first thing you will want to do it to sear the meat. Start by rubbing the meat with a mixture of salt, black pepper, and garlic powder. Mix the seasoning first in a little bowl so that you don’t have to touch any bottles with dirty hands. Rub beef with seasoning generously, on all sides. 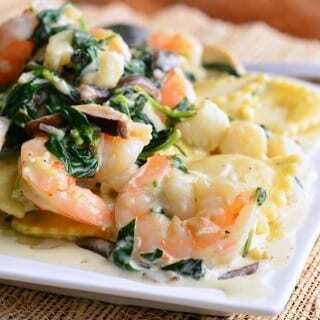 Preheat the pan over medium heat first so that the pan is nice and hot. Hot pan means beautiful sear. Sear the meat on all sides until deep golden brown, then take it out and set aside. Use the same pan to heat up the beef stock mixture. Deglaze the pan with a little stock first to lift all the beautiful bits of meat left in the pan. Then, add the rest of the broth. For best results, prepare the gravy mixture in the pan and heat it through before adding it to the crock pot. Chop and slice your veggies. Add onion to the bottom of the crock pot and place the seared meat on top. Add carrots and pumpkin all around the meat. Pour in the gravy mixture all over the meat and veggies. Put the lid on (remember not to lock it) and set the crock pot to cook on low for 6-8 hours. I usually cook my pot roast for 8 hours, especially if I use rump roast. First, you want to use a knife (blade away from you) to pop the stem off. Then, cut the pumpkin in half and scoop out all the seeds and membrane out. It’s easy to do that with an ice cream scoop or a large soup spoon. Cut each pumpkin half in two because it’s easier to peel the pumpkin skin off of a quarter of the pumpkin. Peel the skin off with vegetable peeler. Dice, chop, or slice the pumpkin as needed. 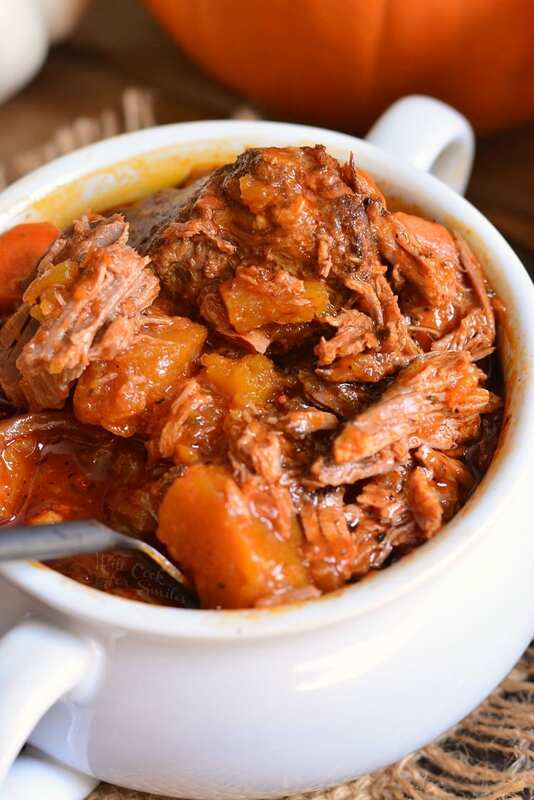 Crock Pot Roast with pumpkin is a perfect seasonal twist on on a classic comfort dinner. 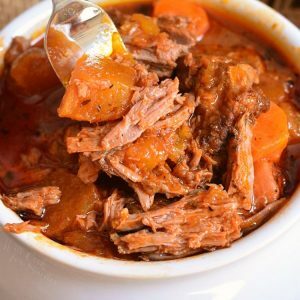 Tender roast made in a slow cooker with fresh pumpkin, carrots, onions, and flavorful tomato based gravy. Prepare your veggies. 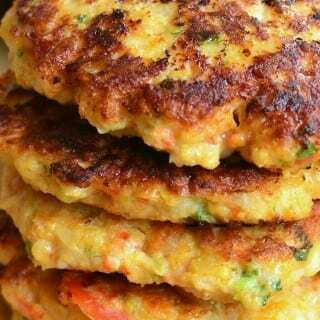 Slice onion and cut carrots into even chunks. 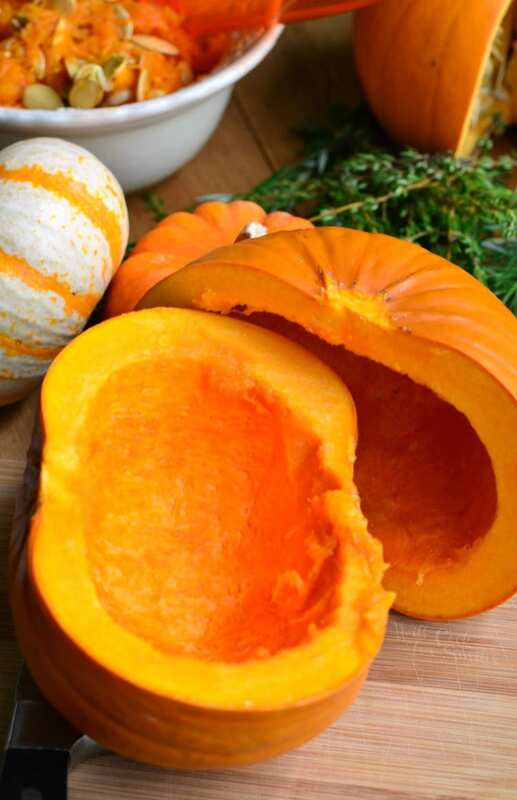 To cut the pumpkin, pop off the stem with a knife (blade facing away from you) and cut the pumpkin in half. Scoop out all the seeds and membrane. Cut each half in two and peel the skin off with a vegetable peeler. Cut pumpkin meat into chunks that are the same size as carrots. Preheat a medium cooking pan over medium heat. 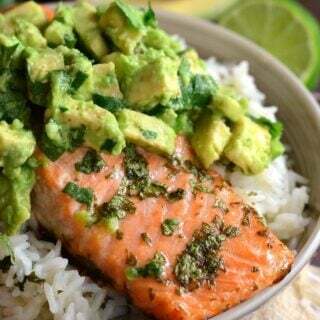 Combine salt, black pepper, and garlic powder in a little bowl and mix well. Rub rump roast generously with the seasoning mixture on all sides. Add canola oil to the pan and sear rump roast on every side until deep golden brown. Once all sides are browned, take roast out and set aside. Smash garlic, chop it quickly and add it to the pan. Saute just until fragrant. Deglaze the pan by adding a little bit of beef stock and scraping it with a wooden or plastic spatula to lift the meat bits. Add salt, pepper, paprika, and thyme. Cook until heated through. Spread sliced onions in the bottom of the crock pot. Place seared meat in the center of the stock pot. Add pumpkin and carrots all around the meat. Pour gravy mixture over the meat and veggies. Cover crock pot with a lid (do not lock it) and set it to cook on low for 6-8 hours. That does look good! I never thought of using pumpkin with beef in a recipe like this, but it makes so much sense! 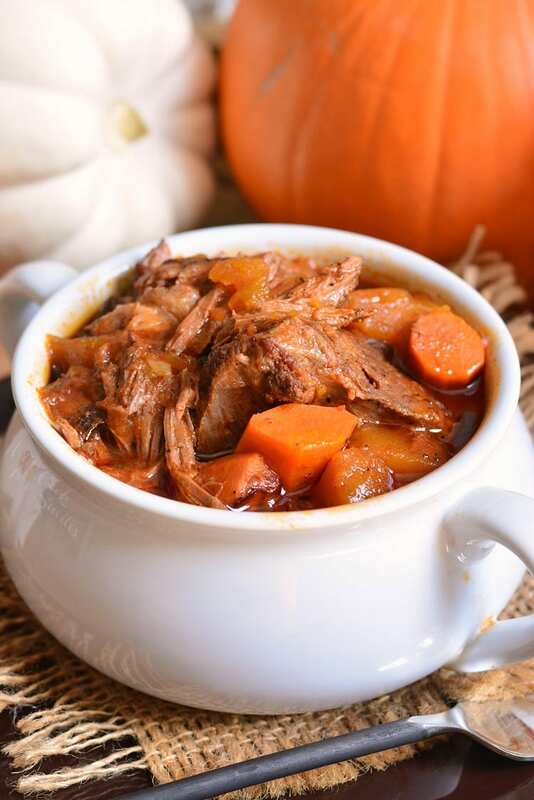 I really love adding pumpkin to savory dishes – adding it to pot roast is such a great idea! 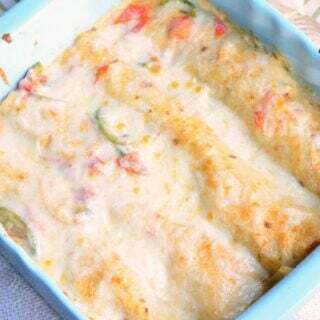 So easy to make and so darn comforting! I love that it is just waiting for me at the end of the day. I completely agree! Thank you, Erin! Do you use equal amounts of salt, pepper, and garlic powder to rub on the roast, and how much do you typically use? There are no measurements in the ingredient list or in the instructions. 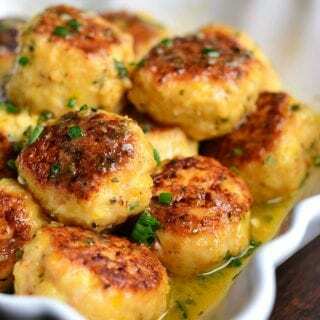 This is such a fabulous fall recipe, and so easy to pull together! !